Thank you so much for the instructions and information. I have seen that you recommend, for stretch marks, 1.5 mm Dermarolling, and then single needling or single line roller for a period afterward until all marks are needled, with the whole pattern repeated after five weeks ( I hope I have this correct). My question -- would it be effective to use the 1.5 mm stamp instead of the single needle/single line roller? Vitamin C, alternating with A-Ret every 3rd day. Tretinoin cannot be used when pregnant, planning a pregnancy or while breastfeeding. -Do the same routine as in week 1 until the rolling day. Roll the stretch mark (the whole area) with a regular roller on the day it suits you the best. Roll them densely with a regular roller. Apply Infadolan immediately after. Continue applying Infadolan for at least five more days. During the next four weeks, use the single needle or a dermastamp or a ONE LINER dermaroller (roll thoroughly and densely) on the individual stretch marks until they are all done. You can for example thoroughly single needle/roll every day five stretch marks (every day different ones) until they are all done. Right after needling/one liner rolling, massage some Tretinoin (A-Ret) into the individual stretch marks. First do a small test patch to see how your skin reacts to it. Apply Infadolan on top of Tretinoin. You should complete the single needling, stamping or one liner rolling of all your stretch marks within four weeks. Give your skin a one-week break and restart the whole process. This time, apply vit. C for 4 consecutive days, roll the whole area with a regular roller, and then during the next four weeks use the single needle or a dermastamp or a one liner dermaroller on each individual stretchmark. The weeks in between dermarolling with a regular roller: keep the dermarolled area moisturized, apply vit. C and Tretinoin at least twice a week. Do not apply both the same day. After about four full sessions, give your skin a one-month break. Then restart again. If you have just a few stretch marks, treat them all in one session (every 4-5 weeks). First, use a 1.5 mm dermastamp on each individual stretch mark: stamp each stretch mark very densely. After you will have stamped all of them, roll the entire area with your regular 1.5 mm dermaroller. If you have too many stretch marks to treat them thoroughly and densely in a single session, you have to spread it out over multiple treatments. In this case you should do it the other way round. First, roll the entire area with your regular 1.5 mm dermaroller (every 4-5 weeks). When the redness is gone (in a few days) and you can see clearly the individual stretch marks, stamp each individual stretch mark densely. Stamp every day (or so) a few stretch marks, until they are all done. I recently just ordered a 1.5mm derma roller to use for my stretch marks as well as all the other products you recommended for before and after... and came across this thread as I'm trying to make sure I do all the steps necessary to achieve maximum results. The question I have is: so in week 2 what day do I begin using the derma roller? could I start day one and apply Tretinoin (A-Ret) or you recommend just infadolan? It depends on you when you start rolling during week 2. Whenever it suits you. Right after rolling, massage Tretinoin into each individual stretch mark. Let it penetrate for some minutes and apply a little Infadolan to the entire rolled area. For the time being, use only the regular 1.5 mm dermaroller that you bought on your lower back. This may be enough for the stretch marks. 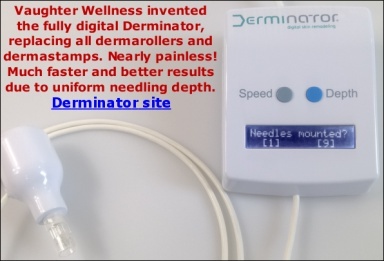 If you get no results or the results on your hips (where you will use the single needling) are significantly better, buy a 1.5 mm one liner dermaroller for your lower back. After months of strenuous research I've decided to embark in dermarolling. I'm 23 years old, and currently in great shape, but gained 30 lbs back when I was 18 and have thin white lines all over my hips to remind me of it. I have a quick question about timing. I'm ordering the roller and single needles tonight, and I'm planning on starting the prep and rolling as soon as the products arrive. However, I'm going to go on vacation to Florida on the 23rd of June (about a month and a half away). I have read the threads about timing, but since it will probably be sunny after I return, I'm just not sure about when (if?) to start rolling now. Should I do one set (1 week prep, 1 time roller, single needle each SM), and then not any more? I have dark-ish skin, and I tan really quickly, and I'm not sure if I should continue to roll after I begin tanning while being on the beach. Any advice is more than welcome, thank you!! Hello to all friends here , I am new to this page and i dont know if I am writing here it is correct. I would like to ask Mrs Sarah Vaughter to give me her precious help also. I am 33 years old and from 19 i hqave strech marks to my breast after loosing also quickly weight loss, those strech marks are now white and medium lenght . Can you please help me to take them off what i have to do ? Buy a regular 1.5 mm dermaroller and a 1.5 mm dermastamp with 35 needles and our 0.1% Tretinoin cream and follow the routine I describe in this forum thread (my reply #1). You don't have to use vit. C.
Dear Mrs Vaughter thank you very much for your advice , may i ask i have 1,5mm dermaroller not the dermastamp i have checked to order it by your site but they doeasnt suppost Greece so sad for me and i cannot also buy the cream . Can I use the 1,5mm dermaroller with tretinoin 0,05 % till i find a site to buy both of them ? Can you advice me please ? Do you start to single needle each stretch mark 5 days after you roll and are done using the Infadolan? I am sorry but we had to stop shipping to Greece because too many shipments got stolen/lost in spite of being sent registered with tracking. Yes, keep on using your dermaroller and the Tretinoin cream. The most suitable is to start needling 5 days after rolling but if you want, you can start even sooner. I dont have vit c and as you recomended i wont buy it can you help me what i must do ? and also can you give me your lights please about dry brushing what i must do ? also i used three days the tretinoin 0,05% and my skin start to peeler is this normal ?also I order the medema cream you thing i did correct this will help ? also may i as k Medema or SCAR GEL or Merz Contractubex is the same creams ? these creams will help me ?and something last how often can i use dermaroller i the week ? I am happy it works for you! Peeling of the skin after Tretinoin is completely normal. Tretinon creams are mild acid peels. I cannot comment on the efficacy of Mederma on stretch marks. An onion extract-based topical gel (such as Mederma) main indication is to prevent the formation of hypertrophic post-surgery scars and to promote the formation of flat post-surgery scars. Your should roll the stretch marks once every four weeks and in between the rolls you should stamp or needle the individual stretch marks. Each individual stretch mark should be stamped or needled once a month. So you can stamp or needle every day but each time, stamp a different stretch mark. I was looking so much for your reply before i start dermaroller it was much bigger my strech marks and i could wear tops i was shy but after I found your site you gave me sooo much help much appreciated .To be honest here in Greece they dont have something like this and i didnt know about it you open my eyes thank you so much.If course I will keep posting my progress just to let people know and to say them to order from you site and to start the treatment with dermaroller and dermastamp they willchange their mood. For last I would like to ask how often can I use dermaroller in the week? Thank you so much again and god keep you stay strong and continue your amazing work. ps I would like also to post some pics from my face to advice me what I have to do about it can I post please? I dont know how to thank you for taking the time and you are taking care all members here and also congrats to this amazing forum it really helps a lot of people that trying to get rid of acne or Stretch Marks . I just want to share with you and all members here how happy I am about the progress with the details that you advise me to do and with the products step by step .I have made three times with dermaroller and with the ret-a i a, looking forwared the week to make dermaroller again.I dont believe in my eyes and my mother too stay surprised with the results . I have been visit too many doctors here in Greece and i have spent so much money to creams but nothing work untill you and your forum open my eyes. I am thankful .I am looking forward for your coments too and also i would suggest to all members here to hear your advises step by step they will be surprised too with the results.